14 Sep Community Development and Sandals Foundation Partnership: The possibilities are truly life-changing. Imagine you were deported are in a refugee camp stripped of everything you know, carrying with you only your story of loss, fear, lack of hope, and will to survive. Now, imagine one morning you open your eyes and you begin to feel hope as you gaze at crops of moringa trees, goats grazing in a courtyard, your children in their uniforms ready to attend school, all as you prepare to head off to your job training with REBUILD globally. Job training that you know will soon lead to a guaranteed job. This is the reality for many of the women and families living in the refugee camp of Fonds Bayard, thanks to the partnership of the Sandals Foundation. Macilia is one of these women whose life is forever changed. 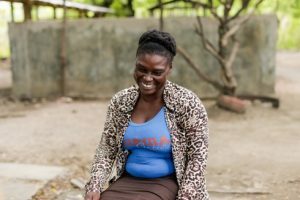 Macilia has lived in a displacement camp at the border of Haiti and the Dominican Republic with her husband and their five children for ten years. We met Macilia last year. She is 35 years old and the only assets she could claim at the time was the one goat and one chicken her family owned. Since she was forced to live in the refugee camp, food insecurity became a reality for Macilia and her family. To support the daily needs of her family, Macilia used her entrepreneurial spirit and opened a small business selling cold drinks, estimating that her daily income averaged $1.50 per day. Until becoming a part of the REBUILD paid job training program, Macilia’s only job experience was informal commerce. She finished the equivalent of 6th grade when she was a child, which, sadly, puts her education level in the top third tier of her peers. With the generosity of the Sandals Foundation, Macilia is a successful participant of a life-changing job training program that guarantees her a dignified, living wage job upon her graduation. Through this opportunity Macilia and 92% of her peers have experienced a significant increase in food security. That means she knows her children can be fed. Addressing the issues of vulnerable communities requires a holistic approach with the right partnerships to create sustainable change. Our holistic Community Development Program does just that…give us a call to find out how you can get involved. Opportunity is what Haiti needs. Why is a Tap Tap so important?